Get rid of dark circles under eyes, reduce puffiness, naturally even skin tone and moisturize the skin under eyes. Results are guaranteed. Value Size. Get rid of dark circles under eyes, reduce puffiness, naturally even skin tone and moisturize the skin under eyes. Results are guaranteed. If the eyes are the window to the soul, then dark circles under the eyes are the shades that can mask the eyes’ and skin’s vitality. They appear literally, as dark circles under the eyes, can make the entire face look tired and puffy. 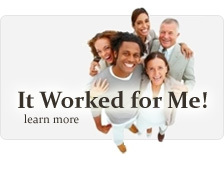 They are the second most common complaint to dermatologists, after acne. Treatments for dark circles vary, although many include toxic ingredients or ultimately prove to be ineffective. Dark circles can be caused by genetics – if your mom or grandma has dark circles you are more likely to as well – plus fatigue and aging. As we age, the fat that is held under the eyes by ligaments begins to lose its elasticity, causing the appearance of dark circles or bags under the eyes. Sinus issues can also lead to the appearance of dark circles. What are the symptoms of dark circles? Dark circles can appear as bluish, gray or black circles under the eyes; they can be small or large. Dark circles are sometimes called eye bags because the less elastic skin under the eyes can droop. Many treatments for dark circles include harsh, toxic ingredients, which are sometimes labeled “all-natural,” yet can’t claim to be certified organic. 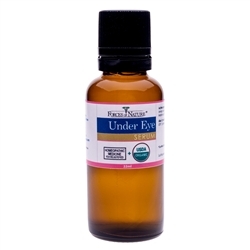 Under Eye Serum offers a safe and truly natural solution to treating dark circles: The world’s only certified organic dark circle remover that is available and manufactured in an FDA-registered facility, Under Eye Serum from Forces of Nature is a force to be reckoned with. Safe for the skin and just as safe for the environment, it includes a variety of effective, certified organic antioxidants, moisturizers and ingredients designed to target dark circles. Under Eye Serum includes Arnica Montana to reduce swelling and dark discoloration, Carduus Marianus to ease pressure around the eyes, Berbis Vulgaris to target dark bluish circles under the eyes, plus certified organic sesame oil, helchrysum, lavandin oil and cypress oil. When combined, these homeopathic ingredients help lighten dark circles and puffiness under the eyes when applied by gently rubbing into the skin up to three times per day. 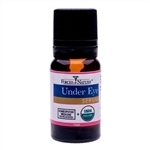 Under Eye Serum was developed in-house by Forces of Nature’s in-house team of doctors and scientists. Results are guaranteed.